It’s been a good long while since I had a Moanface and I’ve been sitting on this one for almost a year now, wanting to see how things panned out, but sadly things got worse. We live in the culture of ‘me’, a culture that has become very toxic. This culture is created and reinforced online by flurries of retweets, likes and favourite hearts which ultimately guide what is said. If you’re honest, you might only get one retweet; or, If you embellish the truth and echo vox pop opinions, then suddenly you’re getting hundreds. This gives positive reinforcement to stay ‘inline’. This has burrowed its way into blogging, politics, business, relationships and our daily lifestyles. When I started blogging around 6 years ago, there were only a handful of men’s grooming and skincare bloggers. Now there are hundreds and hundreds, all marketing themselves as grooming, fashion and ‘lifestyle’ ‘influencers’. One ‘influencer’ I spoke with almost a year ago very candidly told me ‘I don’t know, but they’re paying me a lot for it’ when I asked why he liked a particular skincare product – an especially bad product from a well-known brand. These ‘influencers’ and bloggers are usually white, mid-twenties, bearded/stubbled, barbershop side-parting, and London-based. They mostly dwell on Instagram posting pictures wearing suits, overcoats and stepping off a pavement outside a central London terraced-house with their hands in their pockets. Maybe it’s because I’m not a fashion follower – I just know what I think looks good and what I like – but I can’t differentiate between any of them. So is there anything wrong with this? Surely everyone can do what they want? Whilst this is true, it’s important to think about those who are consuming the content, which is where the selfishness comes in. There’s a fine line between aspirational and unobtainable; particularly when talking about ‘lifestyle’. As a ‘content consumer’, it’s not easy to remember that you’re only viewing a very edited snapshot – everything about it is more or less completely artificial. So by regurgitating the same polished, ‘fake’ content again and again, they’re perpetuating a ‘lifestyle’ that isn’t real. You also need to be aware that a large portion of Instagrammers, with suspiciously high numbers of likes, pay for them – it’s not hard and so far, it’s not obliviously detectable (look specifically for accounts written in Cyrillic and that are set to private). But brands don’t seem to care as London Beauty Queen found out with her survey showing that 20% of PRs don’t care about fake followers – it’s just about justifying PR budget by showing reach and influence – whether it’s real or not. Hosting parties, awards, events and all sorts of other back-slapping nonsense – I used to go to these often as it felt so flattering, but realised what a total waste of time 99% of them were. By gaining more followers (through any means necessary) then comes the lucrative sponsorship deals with brands who’s CEO’s they wouldn’t pee on if they were on fire (if they weren’t being paid). It’s all about money and validation. Other potential ‘content creators’ then see the apparent success and then replicate; the vicious cycle continues. Don’t get me wrong, I didn’t get into blogging because of some altruistic ideal to make the world a better place but because I work in the industry and wanted to share my experiences, expertise and advice. When I started in fact, I didn’t even realise brands would sponsor you to write things (at the time, they rarely did); it was only later on that started happening as brands became more switched onto the power of blogging. I turn down more sponsorship deals than I take because no one wants to see me driving a car, or spending an evening in a casino; everything I do is a balance between what works for me as a blogger and as a business, but also what I know you, my readers, will like and respond to. So what’s going to happen? Well I have a few predictions – I think the arse is going to fall out of Instagram. Facebook is already on with ruining it after they bought the company, firstly by disabling the ability to view posts by time but instead by a ‘smart’ algorithm; I’m sure more is to follow. But these things can’t and won’t last forever – 10 years from now the Job Centre is going to have a queue full of unemployable ‘influencers’ with no discernible talent or ability but it’ll be the most fabulous queue you’ve ever seen! Secondly, and I’m surprised we haven’t already, we’ll reach a critical mass of those fitness, grooming, fashion and lifestyle ‘influencers’ who are all ‘style’ and no substance; however, my fear is that we’ll move onto something equally more ludicrous. Finally for those influencers who are good at what they do, who aren’t fake and who have a passion for the people who read and follow; do something different, do something unique and do what it is you want to do not what you think you have to do. I’ve sometimes fallen into the pitfalls of imitation but it’s important to pull yourself out of it – ethics and morals are hard to find in this business! 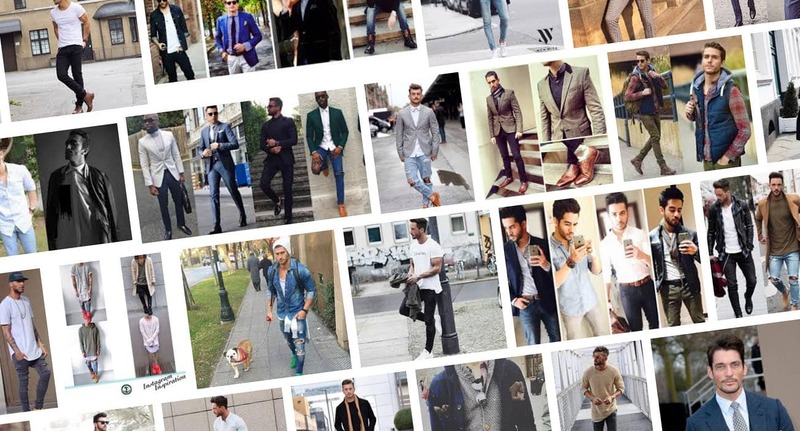 Disclaimer: The feature imaged used is just a screenshot of the Google Image search ‘Male Instagram Fashion’ and is not meant to target anyone individually. This article first appeared on MANFACE written by Thom Watson. It was published on Sunday 12th February 2017 and was last updated on Monday 3rd April 2017 at 12:29pm. It's categorised under MOANFACE where you'll find more related content. I particularly like what you’re saying about the ‘imitation game’. It’s so important to be honest and create content for your audience, not someone else’s. Agreed and not to blow smoke, but your content is a prime example of being honest and creative! i wasn’t aware that brands didn’t care if your stats were genuine or bought. I’m really astonished. Why wouldn’t they care? The cookie cutter aspect of the entire industry – blogging/social media has been apparent for some time now. Blogs have to look like cut down versions of the glossy mags or you aren’t “serious” or “professioal”. t Vimeo and Periscope seem to have mostly disappeared. As for FB, my account is family only. I couldn’t stand the avalanche of religious and political b.s. that was on it when it was a public account. I love Instagram and hope FB don’t F it up, but I’m choosey about who I follow. Twitter is a place I visit less and less, mostly because its reminding me more and more of my old public FB account. What blogs I do follow have been around for years now. The only male bloggers I read at all are you, Andy Millward and Craig Hammond from That Dapper Chap. I think the older audience and certainly older bloggers, are much more discerning about content, who we follow, who we work with. But we do have the advantage of hindsight, which folks from the past couple of years many not. Jane talked about this on British Beauty Blogger too, so it will be interesting to see what direction the whole swarm goes in. Everything changes. What was big becomes boring after it has been overused. The audience also changes, it grows old(er). Brands may find all the social media outlets a cheap way to advertise but I think they also need to regulate what some of these “influencers” act and say. It is advertising and if they lie, it is false advertising, isn’t it? I think some people genuinely do it, but the lines are so blurred between real and fake. I’m certain this will come crashing down one way or another; it has done in the past – when Twitter got rid of all those fake accounts was funny!